The Deployment wiki has had a facelift! All of the valuable deployment-related articles that you need are still available, but with a new streamlined home page. The new design uses the same style elements as the rest of Jazz.net, giving you a more consistent experience on the site. Finding and navigating the wiki is now much easier. 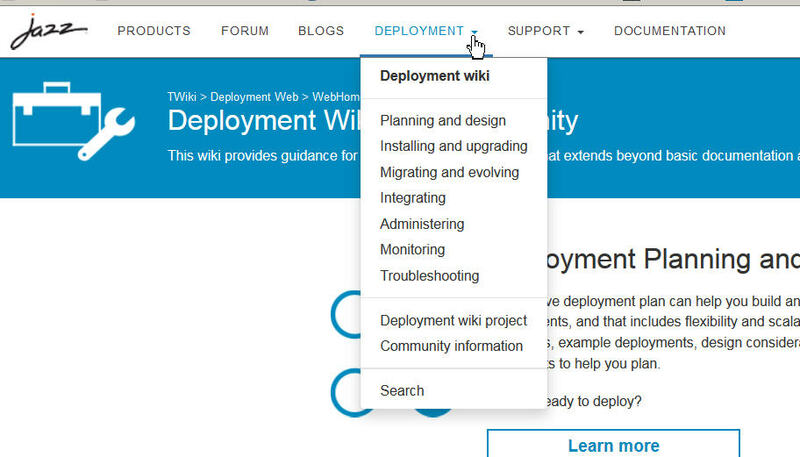 You can access wiki topics easily from the Deployment drop-down menu located in the header of any jazz.net page and quickly find the topic you need. New section icons and more visible breadcrumbs will also help you keep track of where you are as you browse the available content. You can use the jazz.net site search to find information in the wiki, or search the wiki directly from the Search menu.